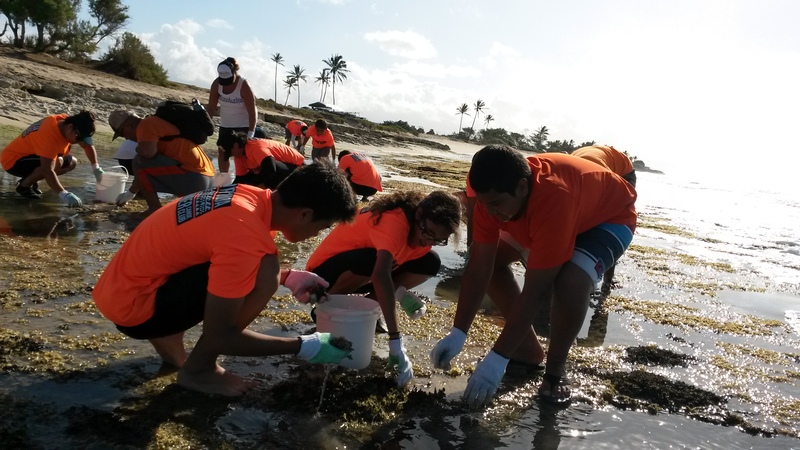 Before starting the removal from the exposed reef on the east end of One‘ula Beach Park, limu experts from the University of Hawai‘i showed samples of the native limu and wild life that volunteers should kōkua and care for. They were then showed examples of the invasive Leather Mud Weed and how to remove it from the reef. We will be hosting another Invasive Limu Project on Tuesday, July 14, 2015. For more information on volunteering email kupuna@hoakaleifoundation.org, or call 808.689.7772 ext. 232.